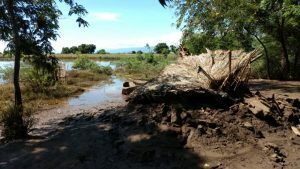 Recent extensive flooding in Malawi has led to widespread damage and destruction in Southern Malawi. Dozens of people have died and hundreds have been injured. Many homes have been damaged or destroyed forcing thousands of people to be displaced. Water sources have been contaminated and water-borne diseases, as well as Cholera and Malaria outbreaks, are posing serious health risks. The Rev. Dr. Blair and Vivian Bertrand are currently serving a three-year appointment with the Church of Central Africa Presbyterian (CCAP) in the Synod of Blantyre. Blair’s assignment focuses on education and youth ministry. He is working with Zomba Theological College, Theological Education by Extension in Malawi (TEEM), and he is affiliated with the Blantyre Synod youth department. Vivian is appointed to work with Churches Action in Relief and Development (CARD). The PCC is accepting donations through Presbyterian World Service & Development to help our partners and victims of the flooding recover from this emergency situation. Donate today and designate your gift “Malawi Flood Relief,” and please keep the victims of the flooding in your prayers.